As many as 2.5 billion disposable coffee cups are thrown away every year, and coffee giant Bewley’s is doing what it can to make that change. In a recent program Bewley’s experimented with ways to change consumer behavior, and they discovered some promising solutions to wasteful consumer habits. When a financial incentive was given to encourage the use of durable coffee cups that could be re-used, many coffee drinkers chose to take the cheaper option. The research was done by a team from Cardiff University, and the metrics they came away with show just how much companies can do to cut waste. The study showed that by charging customers for a cup they use of re-usable cups rose by 2.3%, and by giving away those re-usable cups the useage rate climbed to 4.3%. While these results aren’t staggering, they were tested over the course of a few months, and if given more time they very well could achieve more dramatic effects. The author of the report, Professor Wouter Pootinga had this to say, “While the increases for individual measures were modest, the greatest behavioural change was when the measures were combined”. 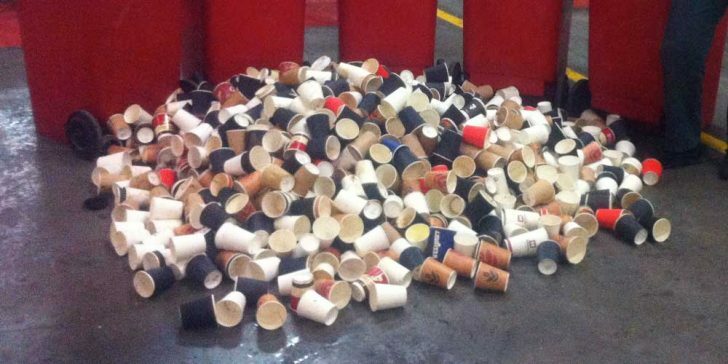 Coffee cups could represent as much as 25,000 tonnes of annual waste, and that is just in the UK. “Our results show that, on average, the use of reusable coffee cups could be increased by up to 12.5 percent with a combination of measures. With this in mind, the UK’s usage of an estimated 2.5bn disposable coffee cups each year could be cut by up to 300 million coffee cups,” Added Professor Poortinga. One of the most important things to come out of this study was the subtle difference in the use of incentives. While offering a discount to people who used re-usable cups had no effect, charging for disposable cups created results. This just goes to show that if you want to make a difference, you have to lean on old habits with fresh ideas that slam consumers where they feel it. It is fantastic that this research has been done, but with so many of the sample cafes being on campus I wonder what validity it would have on the High Street? Banning plastic cups altogether, re-usable or not, would be a great thirst step. Together with their own coffee ground, paper cups would make a great compost tea too. Chimel, if only it was that easy, the disposable paper cup was invented to save lives on health issue, people were reusing a metal cup to consume water. Once we move away from sipping water out of our hand at a stream, everything is going to have a impact on the environment, minimising this impact will be different depending on circumstances. I.e if you are at a 3 day pop concert you will need to consume food and liquid, reusable products could cause huge health issues when you are in the middle of a field. Not if implemented correctly. For example, a deposit system with washable dishes that are returned after use, similar to some cafeterias with trays. I think they tried reusable sat Glastonbury last year, one pound deposit on a stainless steel pot, each time you whent for a drink, you got a clean one, Irtysh Ines were removed from site, taken to a unit, washed, and then returned, I think it has not been repeated this year, the logistics on there own would be a nightmare, and environmental impact of transport has to be taken into account.